**Dystopian coming-of-age with superintelligent A.I. **Rebecca Cordeaux knows exactly what her future will hold: she will marry Andy, her crush of the last five years. Once Andy is ready to settle down, she’s sure he will discover that she is his soulmate. After several small parts on stage, Rebecca knows she can become a renowned actress. Her writing also shows promise as a future author. Robots perform most human jobs that can be automated, leaving many free to pursue their personal creative interests. But Rebecca's mother Karen fears the new world of robots, and insists her brilliant daughter join a university research team, studying the hazards of a complete robotic economy. Rebecca's father Quentin was obsessed with the subject to a degree that even her mother considered absurd, prior to his untimely death. So long as she can reserve enough of her time to pursue her true passions on the side, Rebecca half-heartedly agrees to join the research team, if only to please her widowed mother. There she joins a post-doc named Liam, whose conspiracy theories rival even those of her late father. 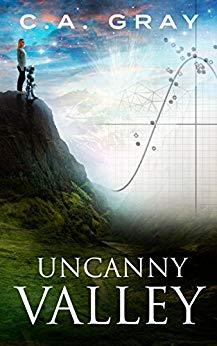 Liam is convinced that world Republic leader William Halpert’s worldwide challenge for researchers to develop synthetic creativity will lead not to the promised utopia, in which every kind of human suffering has been eradicated, but rather to an apocalypse. Rebecca, whose best friend is her own companion bot Madeline, writes Liam off as a bot-hating conspiracy theorist, just like her father was… until she learns that her father’s death might not have been due to mere happenstance.With Liam’s help, Rebecca learns of an underground organization known as The Renegades, where Quentin Cordeaux was considered a legend. While Liam attempts to stop Halpert’s challenge if he can, Rebecca tries to unravel the mystery of what happened to her father. Did he and many of his contemporaries die for something they knew? Who is the mysterious informant who calls himself John Doe, and only seems to want to drive her out of harm’s way? And if Halpert’s challenge is answered, will it usher in a brave new chapter in humanity’s history… or were Quentin Cordeaux’s dire predictions right all along?